WIN A FREE THANKSGIVING TURKEY!! 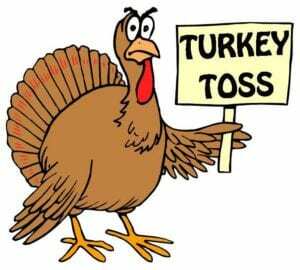 COME AND COMPETE TO WIN A TURKEY! See how many times you can throw a football to hit the target from varying distances. The boy and girl scoring highest in each age category will win a free Thanksgiving turkey! Limit 1 turkey per family. Free prize given to all that participate! Cherry Creek Elementary, 484 S 200 E, the north gym is directly behind the museum. Recreation Mission Statement: To create lasting memories, provide diverse opportunities, build unity, and provide safe and fun experiences for all ages, abilities and interests.